Piper Jennifer Febré Boase playing for competing snare drummer Will MacTavish, while judge Tom Foley listens. Unlike competing pipers, competing drummers are required to provide an accompanying musician, namely a piper, for their performances in front of the judge—the only exception being drum solo events. Obviously, this can mean a logistical problem for the drummer. As a piper, you must be aware of how integral drummers are to a pipe band. We, as pipers, want to encourage and support drummers to the best of our abilities . . . our gentle ribbing of drummers not withstanding! Drummers are almost always very grateful to simply have a piper available to play with them since no piper means no competing for the drummer—a truly frustrating experience! While the responsibility of finding a piper is the drummer's alone, drummers may ask the pipe major of a band to request or appoint pipers to perform with competing drummers. Some pipe majors will facilitate a match, others will not. In some bands, one piper will play for the snares, another for the tenors, and another for the bass. Such an arrangement can sometimes work well; but if a drummer is attending a games without his or her band, their companion pipers may not be in attendance. If you know that your drummer will be competing and you won't be there, let the drummer know as soon as possible. If a drummer asks you to play for him or her in competition, it's not a bad idea to talk another piper into going through the process as well just in case you, for whatever reason, cannot fulfill your obligation to the drummer. Or, if you wish, under typical contest rules, two pipers may accompany a drummer. While this may take some of the perceived pressure off of a single piper at the event, you have the added complication of the pipers' unison and tuning and often it's just not worth it. It is the drummer's obligation to get you the music for the drumming competition with plenty of time to learn the music, at least a couple of months. It is your responsibility to make a serious effort to completely learn the music. Arriving at the competition without the music memorized is unacceptable. Depending on the drummer, you will either need to practice with him or her very little or you may end up practicing considerably more than very little. Pipers have been known to get away with walking up to the judging platform and playing whatever 2/4 march they have handy in their repertoire for a drummer who they have never met before. On the other hand, it's unlikely for strangers to walk up to the judge's table and play in perfect unison—even if you are in the same band and playing your band's tunes, though that may be enough to get you to the goal. The two of you need to agree on a tempo. It would be wise for you to have a game plan should the drummer increase the tempo at the competition beyond what you can play. (This has happened!) You may opt to also practice a stripped down version of the tune with minimal embellishments, just in case your drummer "takes off" with the tempo and such an easier version is needed. A piper playing for a drummer must maintain a very consistent tempo and the tune should be played as correctly as possible. You can also help the drummer by playing the idiom of the music well, such as the "lift" in a strathspey and the strong first beat in a 2/4 march. Truth be told, missed grace notes, unsteady blowing, occasional minor wrong notes, and the like, will not greatly affect the drummer nor his or her score. The judge is not going to deduct points for something beyond the drummer's control. Your goal as a piper is to not throw off the drummer's performance. The most important considerations are the right time signature, even tempo and the right number of parts—even if, heaven forbid, a part is out of order! However, the greater the mistakes in your playing—especially inconsistent tempo or wrong parts—the more likelihood that you will cause the drummer to make mistakes as well . . . and that will affect the drummer's placement. When both you and your drummer are entering competitions at a single venue, note on your entry forms that you will be playing together at the drumming event so that the playing orders can be set accordingly. And if you learn in advance of the games that there is still a conflict, I'd recommend that you contact the competition organizer and let them know and see if they are able to move the competition order of either you or your drummer. Obviously, you can't be competing solo and play for a drummer at the same time, so communication with the event coordinator is helpful. While we want to support drummers, don't over-commit yourself and promise to play with a bunch of drummers only to find yourself too tired to play well. If you are tired and a drummer asks, explain the situation and if the drummer is desperate, play anyway—worst case, just cut out if you start losing it during the performance and let the drummer finish on his or her own, which is permitted in the contest rules. If you are going to play for several drummers, it'll be in everyone's best interest to agree on the same one or two tunes. Standardization will help the performances. It goes without saying, but never flake out on a drummer and not show up. If you get sick or otherwise can't be available for the drummer, then you find your own replacement. Don't force the drummer to find someone else at the last minute. Call in those favors owed to you by your fellow pipers—or owe a piper friend a favor! Snare drummer Ben Febré and his mother Jennifer warm up for a competiton. On the day of the competition, make yourself available early for the drummer so that the two of you can run through the tune at least once or twice. If you are competing solo yourself, you will need to coordinate with your drummer and let the drumming steward know if there is a conflict despite your best efforts in advance of the competition. 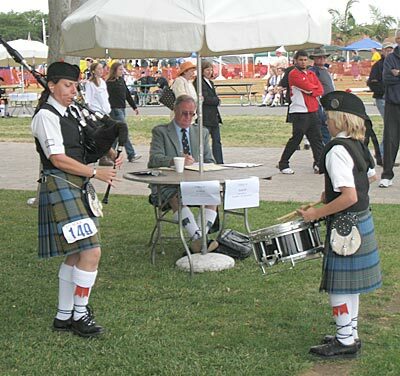 As any piping competitor knows, competitions rarely run precisely on schedule! Be there well before the drummer's actual competition time. The last thing a drummer wants to do is run around looking for their wayward piper who's off at the beer tent having lost track of time. 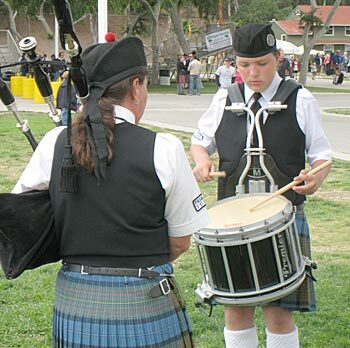 If a drummer grabs you and asks you to step in and play, but you aren't in highland dress, know that you do not have to be since you yourself are not competing. That said, it will make a better impression on the judge if you are in a kilt and the rest of your piping garb, so it's recommended that you do it if you can. Don't decide on your own that you just aren't going to show up in a kilt, at least give your drummer warning so he or she can either plead with you or find another piper if dress is important to him or her. Do not unilaterally decide to change the tune at the last minute. Only change it if the drummer demands it. The drummer calls the shots, the piper is there for the drummer. Again, the drummer is absolutely in charge, you are not. Even if you are the pipe major of the band of which you are both members. The piper must let the drummer determine the tempo, not vice versa. That goes for the entire tune. If you are ahead of the beat, it is the piper's job to conform to the drummer's beat, not the other way around. That said, if a drummer is having serious tempo issues, you'll be doing the drummer a favor by trying to return the tempo to the originally established one. Now, drummers do have a tendency to play fast, often faster than the piper can play correctly. It may be prudent to remind the drummer of the agreed upon tempo right before walking up to the judge's table. Also remind the drummer that if the tempo is too fast, the piping will go to hell in a handbasket and that can affect his or her drumming as well. While performing with a drummer if you are not 100% sure of the tune (ideally, it should be drop-dead memorized), since you are not competing yourself in this instance, you can have someone hold sheet music for you or if the judge doesn't disapprove, you can place the sheet music on the judge's table. Go ahead and take your time to properly tune your pipes. Again, you are not the one being judged, but you'll improve the overall impression, plus poor tuning can be distracting both to you and everyone else around you. One thing to know is that you don't have to do a band competition strike-in. If you wish, you may start your drones, let the drummer set the tempo, he or she does two attack rolls then start playing the tune. If you are more comfortable with a band style roll-off and strike in, then stick with that . . . though there is always that random time when a drone double-tones instead of locking in! Since you are not marching back and forth, you may find it helpful to tap your right foot for the first time through a part and your left foot for the repeat. (Or vice versa, of course.) Forgetting a repeat is a mistake that can have the huge impact on drummers and their final placing. If you realize that you missed a repeat, it's best to either cut out or if you know you can successfully get back onto the tune, do that. If your marking time by visible foot-tapping bothers your drummer, just move your toes inside your shoe. If you accidentally cut out during a tune, do not try to get back into the tune unless you are certain that you can actually do it. A fumbled attempt can affect a drummer much more than simply dropping out. Remember, the performance is not about you, it's about the drummer. Don't stress yourself out. You are the plate, not the food. Have fun. Just relax. Keep in mind that you are doing the drummer a big favor and just do the best you can. "I remember the first time. I had just started with the band and was walking across the field after finishing my solo event. Some drummers in the band came up to me and asked, 'Can you play a 2/4 march for our student?' (It was his first event.) I was too naïve to know that one is supposed to be nervous to play for drummers or dancers! I said, 'Any 2/4?' 'Yep', they said. So they walked me over and I just started in and we played. He ended up taking 2nd. I think I was never more pleased in helping someone else win—the same feeling when a student of mine does well in competition—more so than any victory I had." This page last updated Wednesday, April 14, 2010. Page first created in April 11, 2010.